Another treatment option for keratoconus or post-LASIK ectasia is intrastromal corneal ring segments (ICRS), such as INTACS1 and KeraRings2. 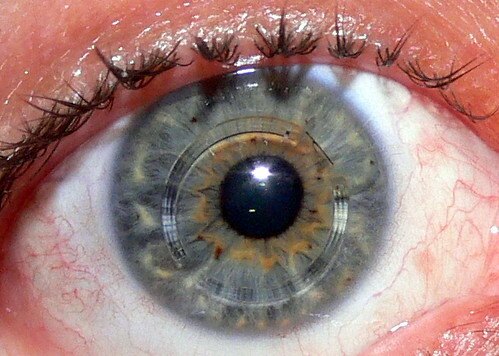 Intrastromal corneal ring segments are thin plastic arcs that can be implanted in the corneal stroma through a small surgical incision on the cornea and they help restore clear vision in keratoconus patients by flattening and repositioning the cornea. ICRS may be used for patients with keratoconus who are no longer able to achieve good and comfortable vision using contact lenses or glasses and it is considered as a surgical alternative to corneal transplant, however it can't prevent a corneal transplant if keratoconus continues to progress. ICRS may not halt the progression of keratoconus, but the treatment can be combined with corneal collagen crosslinking to strengthen corneal tissue while improving the vision. INTACS were approved under a Humanitarian Device Exemption (HDE)3 by the FDA in July 2004 to be used for treating keratoconus. INTACS are made of polymethyl methacrylate (PMMA), the same material that is used in intraocular lenses. INTACS is available in three thicknesses, 0.25mm, 0.30mm and 0.35mm. It is recommended4 that INTACS should not be used in keratoconus patients who can achieve functional vision on a daily basis using contact lenses, are younger than 21 years of age, do not have clear central corneas and have a corneal thickness less than 450 microns at the proposed incision site. The procedure is typically performed under topical anesthesia and takes about 10 to 15 minutes. no corneal tissue is removed during the procedure, the implantation is reversible and the rings can be removed, changed or adjusted if needed. although, like any surgical procedure, there are some risks, including infection, and patients may experience visual symptoms including difficulty with night vision, glare, halos, blurry and fluctuating vision.